A collection of the best blue gray paint colors along with examples in real homes! There are so many beautiful options that work well for walls, doors, and more! Before we get into today’s post, I first want to say THANK YOU!! More like scream it because I was blown away by your response to yesterday’s post. I’m still actually processing it all – holy cow! It was a bit of a scary post for me to publish, so I can’t thank you all enough for your sweet words of encouragement and support. Seriously – you guys are the best! 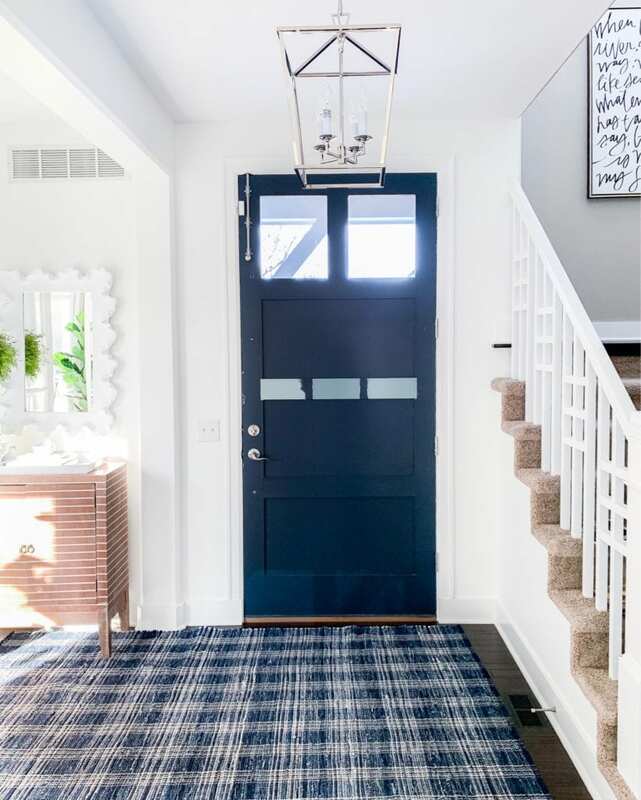 In a total 180 from yesterday’s post, today I’m finally sharing our freshly painted front door along with the best blue gray paint color options! Previously our front door was painted Benjamin Moore Hale Navy. I actually really loved the color but it felt a bit dark in this area of our entryway that doesn’t get a lot of natural light. The door had also gotten a bit beaten up during our kitchen construction last summer and was in need of a repaint regardless. I decided I wanted to go with a muddy blue gray color with slight green undertones (versus purple). I spent several hours researching online as well as asking many of my readers what their favorite options were. After compiling all the results, I’m sharing the best blue gray paint colors! Somewhat surprisingly, not one Sherwin-Williams paint color made the list. I think they excel on the slightly greener versions of these colors (like Sherwin-Williams Sea Salt). 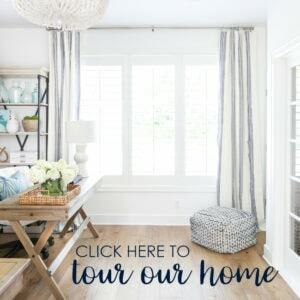 Following are my top picks for the best blue gray paint colors! At the end of this post, I’m sharing real-life examples of how these colors look in real spaces! A month or so back I tested three color samples on our front door. From left to right you can see (all Benjamin Moore): Wedgewood Gray, Van Courtland Blue, and Water’s Edge. All were such beautiful options that I don’t think we could have gone wrong with any of them! 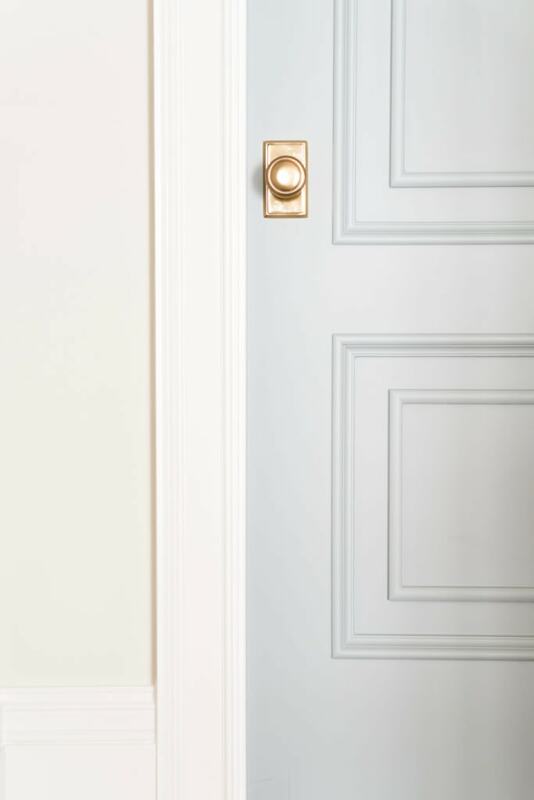 Painting the interior of your front door is such an easy project! Not only is it super affordable, it can be done in a few hours, even with multiple coats! You can see my method on how I paint our front doors in this post. This time around, I actually just ended up using the sample pot of paint from the Benjamin Moore store! I selected Benjamin Moore Water’s Edge and couldn’t be happier with how it turned out! I’m also just a tiny bit obsessed with our new striped rug. It’s indoor/outdoor and virtually indestructible! It comes in multiple sizes but they are all posted as individual listings. You an also find another size here. And it still looks beautiful paired with the Benjamin Moore Hale Navy in our office! When I’m on the hunt for a new paint color, I love being able to see real homes with colors I’m considering. It can definitely help narrow down the selection process! 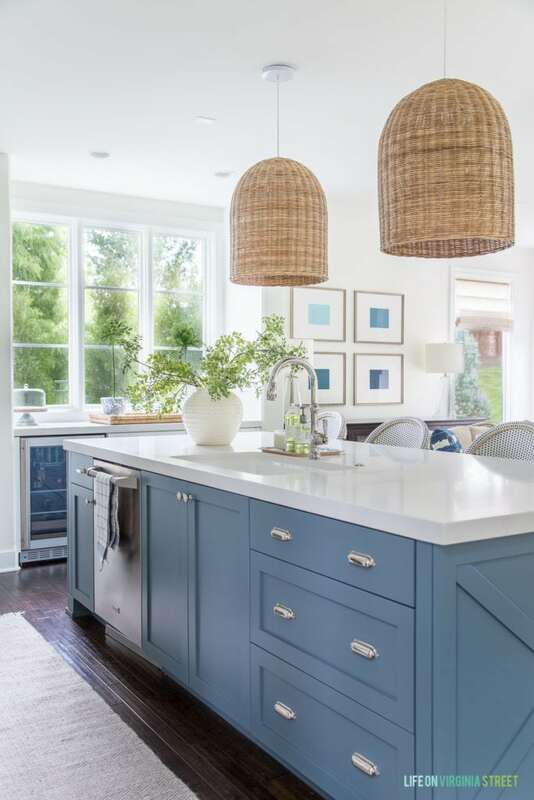 Following are some examples of the best blue gray paint colors in real spaces! In our kitchen remodel, we used Benjamin Moore Providence Blue and absolutely love how it turned out! This space get a lot of natural light from multiple angles so the color looks a bit lighter here than it likely would in most spaces. However, it’s a beautiful darker blue gray paint color option! 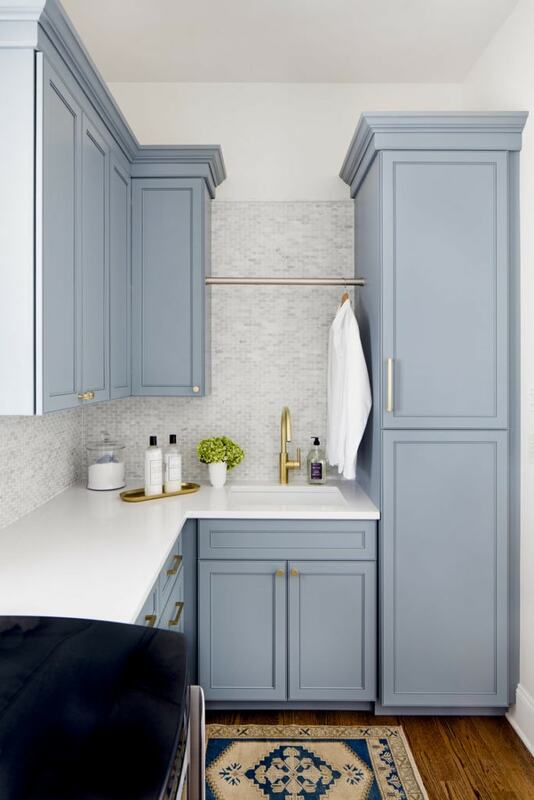 The gorgeous laundry room cabinets below are painted Benjamin Moore Van Courtland Blue which seemed to be a super popular pick among readers! 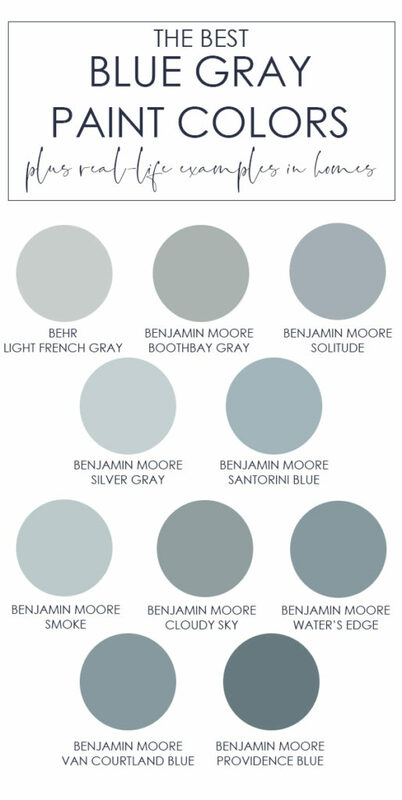 Perhaps the grayest of all the options, Benjamin Moore Boothbay Gray is a super popular choice on doors (interior and exterior) right now! In our last home, we used Behr Light French Gray and it had a really beautiful tone to it (as to do the color one shade lighter and darker on the paint swatch). It’s a beautiful light toned paint that looks more blue in some lights and more gray in others. 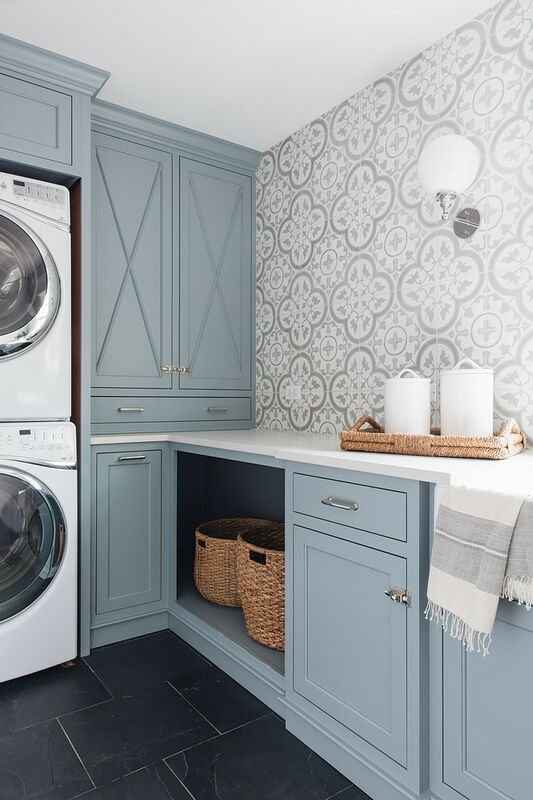 These laundry room cabinets painted in Benjamin Moore Cloudy Sky couldn’t be dreamier! 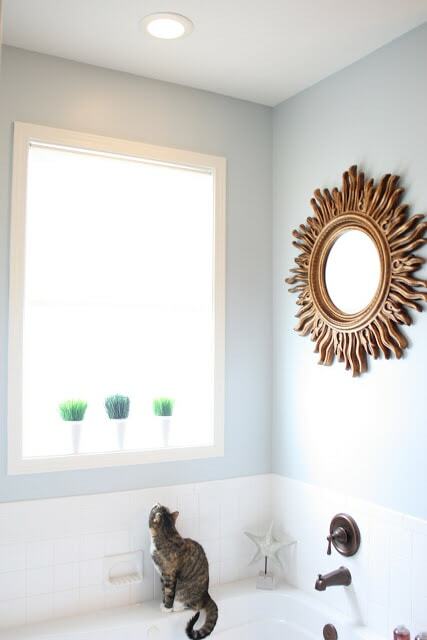 If you’re looking for even more ideas, be sure to check out my post on light blue gray paint color ideas! It’s full of options that look a bit lighter than the examples shown above! Are you a fan of this color tone? I can’t get enough of it lately! 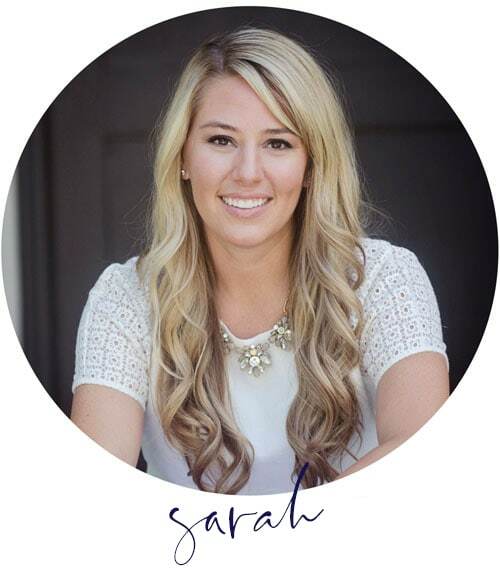 Hey Sarah! Thanks so much for this helpful post and the reference back to your painting process. Do you add Floetrol to the paint at all or did you have any issues with brush marks (assuming you used a brush for the more detailed areas)? When I use a semi-gloss paint, I usually will use Floetrol if I’m painting with a brush. However, Benjamin Moore now has a line where I don’t even add Floetrol (it’s self-leveling paint so essentially has it built in). That line is just called Benjamin Moore Advance 🙂 It’s what I used to paint our powder bath cabinets and a lot of the trim I’ve painted recently. I hope that helps! 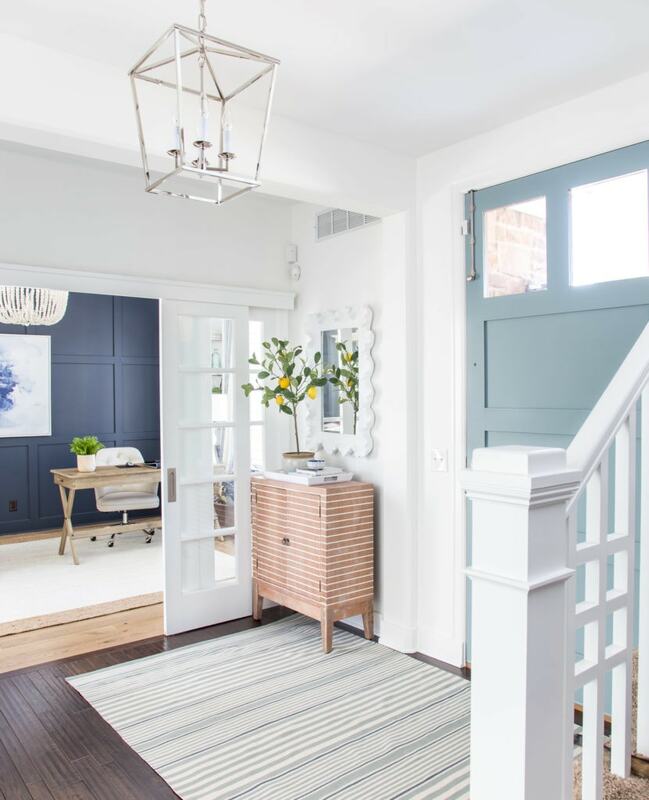 Ahhhh your entryway is gorgeous! Like you, I really love most of the colors you shared and I don’t think any of the options would be poor choices! 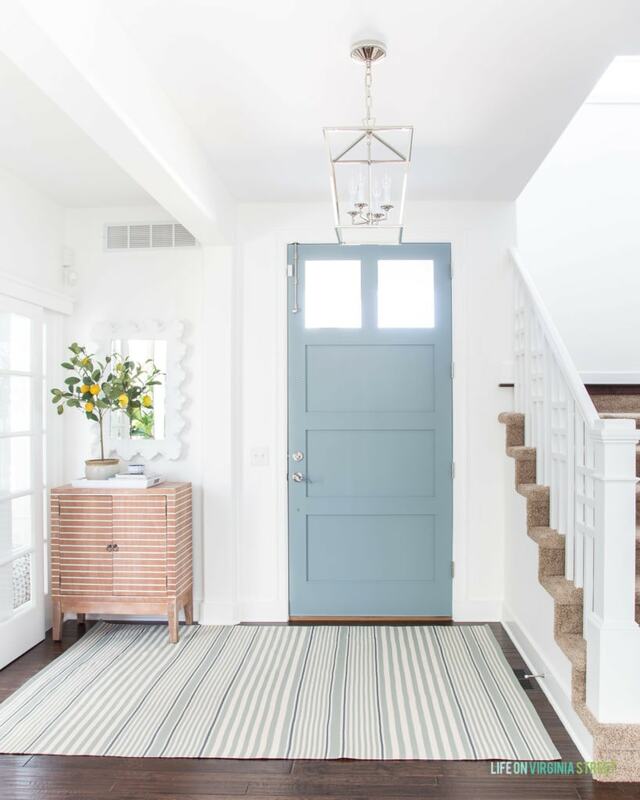 Question about the upkeep of your entryway rug. I’m scared to pull the trigger on anything that isn’t dark because of muddy shoes…we live in the Midwest, so like Omaha, there’s always rain, snow or mud. I want my guests to wipe their feet off on the rug, but I don’t want to replace the rug all the time. How do you suggest cleaning these indoor/outdoor rugs? Power wash? A regular hose and dish soap? Hi Kara! Sorry I missed your comment before. On the rug, you can literally just take it outside and house it off! Ours got mud on it recently and clean-up was a breeze. You can definitely use dish soap on it too, but I’ve never needed to yet. They’re made of recycled water bottles (but don’t feel super plastic-y). I read on their site that you can even use bleach on them if you have to! Just wanted to give you a shout-out that I love your style and enjoy looking at your blog- especially as a fellow Omahan. I am thinking I need to try one of these gorgeous paint colors in my home. The perfect refresh to welcome spring! Great choice! Love the new rug too.